Halloween Sessions 2018! Every Shoot Featured in the Retro Lovely Halloween Edition! Halloween. My favorite holiday and it should be yours too! This year there’s several sessions available AND every single participant will be featured in the legendary Retro Lovely Magazine. With over 2 million fans it’s the 2nd largest and one of the best known publications of its kind. BUT WAIT THERE’S MORE. One lucky lady from among all the 2018 sessions will be selected to grace one of the Halloween Edition’s COVER. (Each of the current Retro Lovely Partner Studios will have a version with one of their models as a cover). 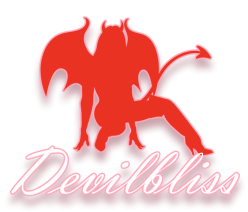 Maybe you can represent Devilbliss Studios! For cover selection I will chose images from each session I feel most fitting to be a cover and then present the entire group of them to the other studios among Retro Lovely Partner Studios to arrive at consensus of the image to be used. So what sessions are available? 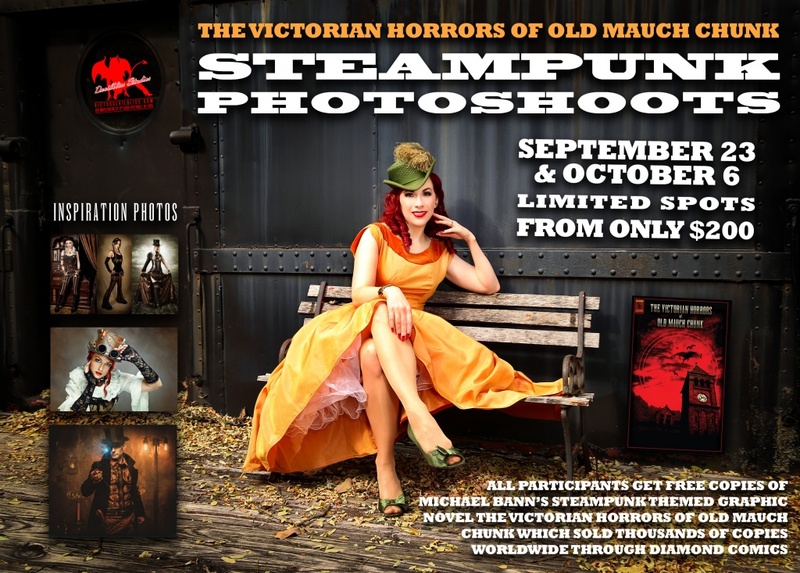 As Steampunk is heavily “costume” based this is a perfect crossover session for those who love the genre and wish to take part in the Halloween promotions. Check below for pricing and click the graphic above for more information on this session. While the studio has plenty of corsets and will have some accessories and set pieces we do not have full blown Steampunk costumes. This session is for those who are into this genre already and have wardrobe of their own. We have also been granted the use of several pieces of amazing high end metal art that will far exceed the sort of props one could obtain from Amazon or any other reseller for that matter. Devilbliss Studios has offered this for the last 4 seasons and it’s no wonder. It is a classic. So iconic and rich with the season these sessions are fantastic for a first time model. They can be sweet or sassy as you choose. Pricing and availability below. 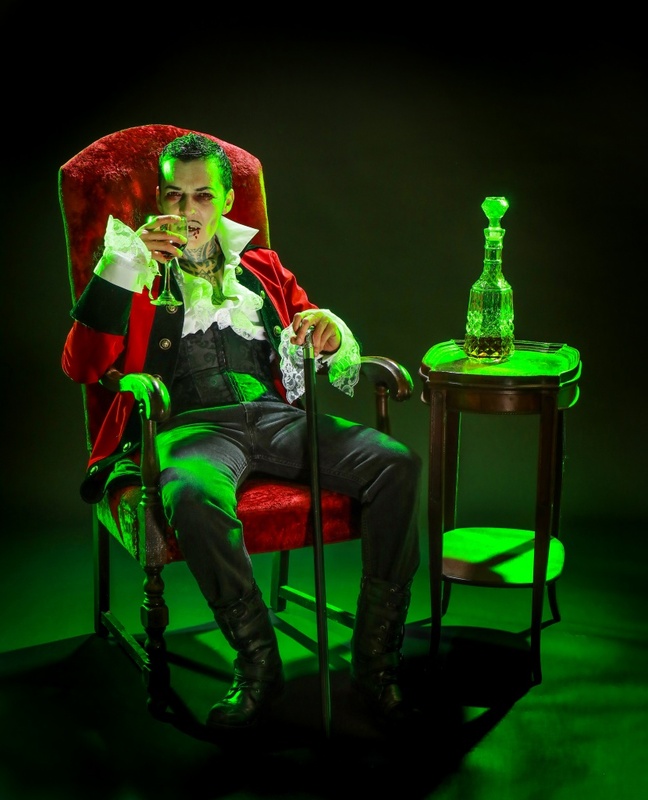 This session was brought into the lineup last year and it produced many great images as well as one being used for the Halloween Edition of Retrolicious Magazine. (more you can see below) Pricing and availability below. There are several classic cheesecake Halloween photos which are super fun to recreate. This sort of session is perfect for the beginner as you literally have a road map on how to pose! For these sessions we would need to discuss in advance what you’d like to do and we can search for some examples that could be ideal for you. Another fun session is very simply down to basics, you in a costume of your own on classic paper or one of the several backdrops we have in the studio. Hit us up to tailor it to you! Pricing and availability below. It’s iconic, it’s fun, it’s adorable, it can be spicy relevant to your wardrobe choices. Pricing and availability below. The Blasphemous Rumors set has been very popular. It would also be well suited to doing some themes perfect for Halloween. From naughty nun to possessed demon. Think The Exorcist. Or perhaps we dump a bucket of blood on you and you can live your dream of being Carrie just like Sissy Spacek. Pricing and availability below. This is actually a simple set with tons of mood provided by unusual and creative lighting. Additionally we have several classic printed backdrops that could add a great deal of variety depending on your costume. Pricing and availability below. I will indeed travel with you to a cemetery for some one of a kind photos. I have a few within a short distance of the studio we could use as a backdrop but do understand I won’t do anything disrespectful to any grave sites. These are custom sessions and would need to be discussed and planned. Want to tackle something wholly unique and exclusive to you? Just ask. We’ll do our best to meet your imagination! 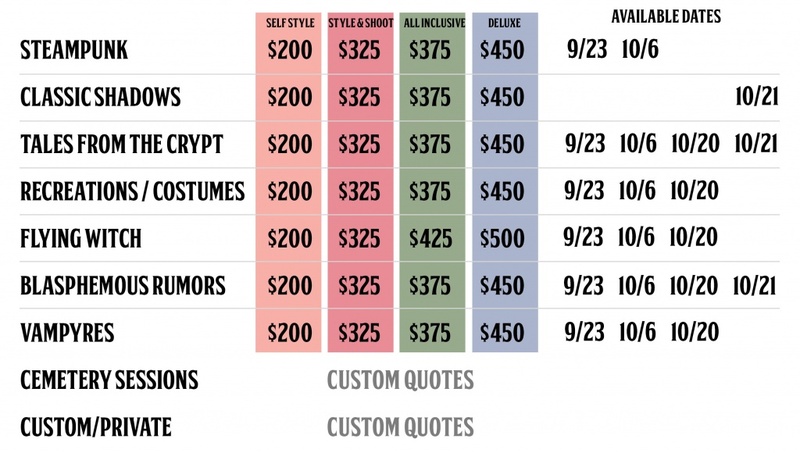 Pricing and availability, click to enlarge. Unlike most sessions I offer, the Style and Shoot for these includes 2 edits chosen by me for inclusion in the Retro Lovely Halloween Special Edition. The only session that costs more with additional edits is the Flying Witch, which requires more editing time to create those images. Sessions are per person. Edits are per face. Additional samples will be uploaded soon.